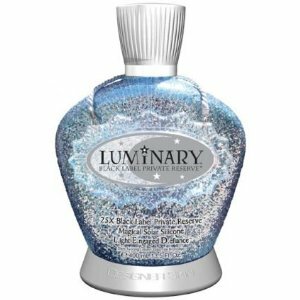 Luminary 25x Black Label is a lotion designed for sun bed use. This lotion is new to 2010 and is voted by users to be one of the best tanners to provide the darkest most natural looking tans. According to Black Label the revolutionary L.E.D.TM complex works as a multifunctional system to help combat free radical aggressors and boost skins overall tone, elasticity and appearance. It also contains soft Celestial Stardust, which helps to filter the light letting just the right amount onto the skin to give it a natural luminosity. The lotion has a therapeutic essence of sweet champagne fizz which seems to prove very popular with most of the users. I have gathered the information below from the opinions of the people using the tanning lotion. Luminary 25x black label is pretty well known among you bronzed ladies or even those of you that want to get bronzed. Most of the users think this tanning lotion is the holy grail of tanning lotions as they say it gives natural color fast. The golden ladies also relish the perfumed fragrance as most other tanners smell fruity. However, there are some users who think it doesn't really work any better than cheaper brands. It is quite pricey at $45.99 special price, it usually costs $120 for a 13.5oz bottle. Personally that is over my budget but it has very good reviews so could be worth a try if you can spare the cash. You are currently browsing the archives for the Self Tanners category.